On April 12, 2017, the Council of Ministers passed decision (VKM) 325, in which they declared a significant part of central Tirana to be a legally protected “Historical Center.” Although in itself a laudable initiative, which updates a previous VKM from 2000, the government itself has violated the regulations it proposes already numerous times, to such extent that the VKM is practically useless. Moreover, several landmark buildings are not included in the “Historical Center,” which implies that they are not worthy of the same care and protection as laid out in the VKM. The “Historical Center” of Tirana according to VKM 325, April 4. 2017. We first note a significant number of inconsistencies. Whereas the Cultural Palace on Skënderbeg Square and the National Gallery of Art, built during the communist period, have been included in the protected zone, the National Historical Museum, the Pyramid, and Palace of Congresses, all significant landmarks of their own, have been excluded. The same holds for the twin theater buildings behind the Ministry of Interior Affairs. Similarly, the protected zone excludes most of the medieval Castle of Tirana, where illegal construction work is currently going on. Furthermore, it should be noted that one of the last complete villas of Tirana, a Category 1 Monument known as Sarajet, falls also outside the protected zone. Interestingly, the map used by the Council of Ministers to indicate the area of the protected zone does not derive from the recently drafted General Local Plan of Tirana, but dates from at least before Edi Rama, then mayor of Tirana, started his first attempt to overhaul Skënderbeg Square. As is clearly visible, the original layout of the square is still visible, as is the communist-era fountain on Mother Theresa Square, and the now destroyed Qemal Stafa Stadium. Absent is for example the Orthodox Cathedral. 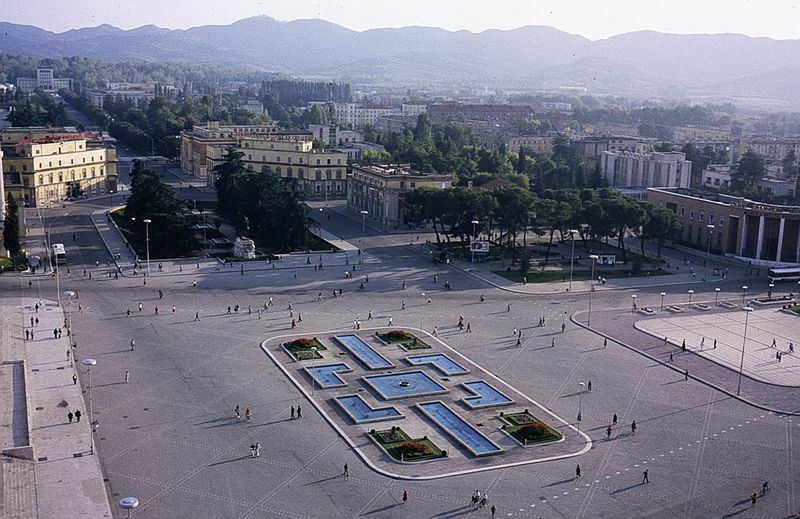 The historical center of the city of Tirana is the urban space with important architectural planning values that documents the historical development of the city of Tirana and accomplishments in architecture and city planning. This is simply not true. As I indicated above, the Tirana Castle, important Ottoman architectural heritage, and several highlights and veritable accomplishments of architecture from the communist period are simply cut out of the historical center. Systematic conservation, restoring, and maintenance interventions, as well as on monuments of both categories based on criteria for conservation and restoration. Restoration interventions that aim for the protection of the urbanistic–architectural, the traditional road network in composition and technique, as well as keeping the configuration of plots for relaxing spaces and traditional vegetation unchanged. Based on the map included in the VKM, which is an “inseparable” part of it, one would say that this is completely useless and empty rhetoric. Apart from the enormous changes in the city center over the last 27 years, only part of which is actually indicated on the severly outdated map, the Rama government has made several interventions which openly violate this regulation. Construction work on Skënderbeg Square. Perhaps the most obvious violation of the protected zone is the reconstruction of Skënderbeg Square, which in now way aims to keep the original configuration of space and traditional vegetation, but radically intervenes into lines of sight and the architectural relations between the buildings adjacent to the square. Similarly, the removal of the communist-era fountain on Mother Theresa Square, for the simple reason that the Pope was visiting, has severely damaged the configuration of a space which Mayor Erion Veliaj promised to be a “pedestrian zone,” but has in fact become yet another busy intersection occupied by cars. Interventions in monuments of the first category protect the original composition and techniques both inside and on the facade. In case part of the monument has suffered damage, transformations, or removals, interventions to complete the building to its original state may be undertaken. Interventions in monuments of the second category protect the initial volume and appearance of the facade, while on the inside changes may be made, implementing schemes according to the demands of the period and current techniques. The backside of the “restored” Ministry of Interior Affairs. For example, former Minister of Interior Affairs Saimir Tahiri’s “restoration” of the Ministry building has changed the traditional yellow/red color scheme, introduced tacky copper plumbing which is already degrading, and moreover added a large (and illegal) annex to the building in its backside courtyard. As a result, the compositional integrity of the Italian-period government buildings at the south entrance of Skënderbeg Square has been completely destroyed. Philippe Parreno’s “Marquee Tirana” disgracing the Prime Ministry. Another example is Prime Minister Edi Rama’s intervention on the facade of the Prime Ministry, another building from the fascist period. The installation of Philippe Parreno’s “Marquee Tirana” is in full violation of art. 8(2), as it completely breaks up the unity of the facade, while damaging the marble coating of the building. In this [protected] zone, restorations, adaptations, reconstructions, and new buildings are made in order to increase the values within it and for the improvement of the living conditions, which have to be in harmony with the architectural and urbanistic character of the ensemble. The maximum height of new buildings or reconstructions and adaptations, expect in cases when there are special studies, should not exceed the height of the highest object in the Historical Center. The new design for the Qemal Stafa Stadium. The part that I marked in bold is obviously the sneaky part. For example, the Prime Minister last year single-handedly ordered the destruction of the monumental Qemal Stafa Stadium, and the construction of a new stadium with skyscraper, the height of which is completely unknown. He even transferred the ownership of the ground on which the new stadium is to be built to a private company, thus privatizing part of the “protected zone.” Certainly, the new stadium is one of those exceptions where there must have been a “special study,” because hardly any details of this project have been made public! Ironically, at the moment the skyscraper is finished, it will be de facto the highest building in the “protected zone,” which means that any other towers, planned or unplanned, will no longer need “special studies” in order to conform to this regulation. All the examples above show that the government of Edi Rama, including the Ministry of Culture headed by Mirela Kumbaro, care very little about cultural heritage in the country and the city of Tirana. Not only because they fill their pockets by selling of restoration or construction work to “friendly” companies. They are also just not interested, are intellectually capable of understanding, the protection of architecture and public space for their intrinsic value and beauty. They only care for it when it can generate profit through “tourism,” through a singular mode of consumption not based on real interest and passion, but fleeting and superficial consumption.